Blending signals and mixing audio is what patching is all about. Consider mixing up to six audio or CV signals down to three separate busses. Now take it a step beyond by sequencing or toggling mute states on the incoming signals with CV from a clock source, sequencer or even a random source. 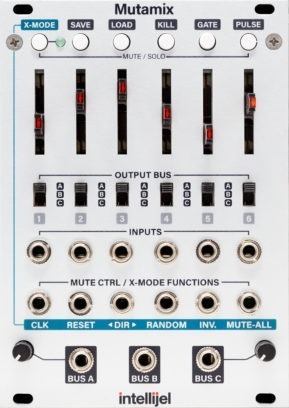 The unique configuration of the Mutamix allows it to function as much more than an Audio/CV mixer, opening up possibilities for sequential switching, complex modulation routing, voice allocation or hocketing, step sequencing, or combinations of all of the above! 6 Linear LED sliders for input attenuation control. 6 Three-way bus routing switches. 3 Audio/CV BUS outputs with attenuators on A and C.
Header to normal Linix output to the 6 inputs.